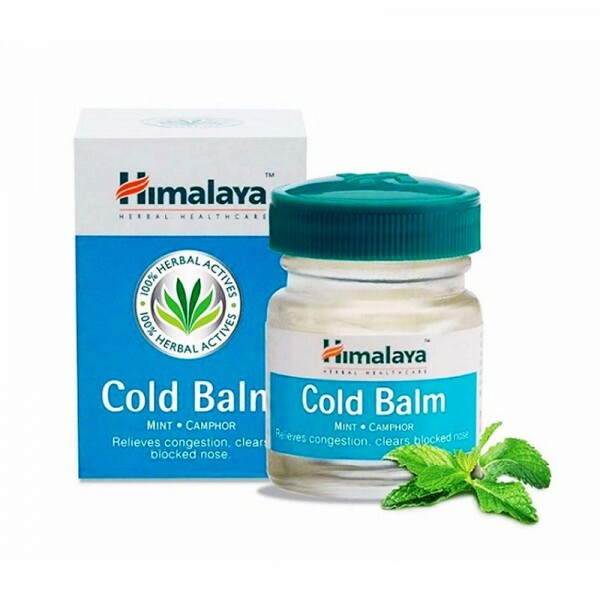 Himalaya's Cold Balm is a soothing balm that relieves nasal and chest congestion. Its counter-irritant effects relieve headaches and body aches associated with the common cold. Camphor Oil extract acts as a skin stimulant and counter-irritant when applied externally. The oil of the Blue Gum Tree is easily absorbed and is topically used as a massage oil. It can also be used as a dry inhalant. Mint extracts reduce nerve pain and help reduce fever. Turpentine Oil extracted from the plant Chir Pine, is used in many ointments and liniments for treating minor aches and colds. It relieves irritation and also decreases skin redness. Nutmeg Oil is used as a counter-irritant and stimulates blood flow to the area applied. Apply locally on the nose, forehead and chest. A noncomparative phase II clinical trial was conducted at ESI Hospital, Kolkata, India, to evaluate the efficacy and safety of Himalaya's Cold Balm in the management of symptoms associated with the common cold. There was a highly significant reduction in nasal stuffiness, sneezing, rhinorrhea and watery eyes in all 40 patients at the end of the study.